My latest Stratocaster addition is my new favorite. It's another partscaster. 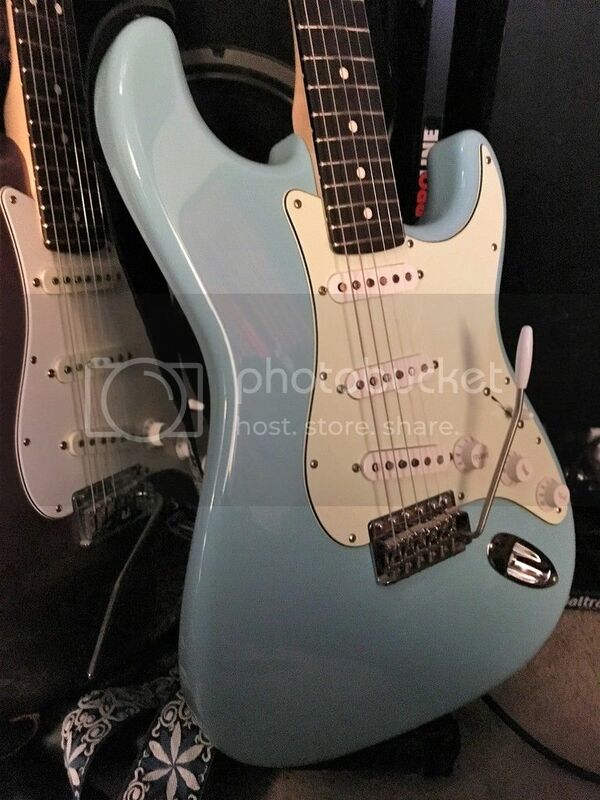 The body is a Fender MIJ '62 Vintage Reissue in Sonic Blue (looks more like Daphne Blue). The neck is a new Fender MIM 22 fret that I bought from Amazon. The hardware is a Callaham bridge w/ mid-length push-in arm, Fender locking tuners and the stock jackplate. The electronics are a 5-way CRL switch, CTS pots, Orange Drop cap, Switchcraft output jack and cloth wire. The pickups are D. Allen Tru '62 - Alnico 5 with modern stagger. The best Strat I've owned is a parts-o-caster that I put together with components purchased online. CS '69 neck with 9.5 radius and big frets. Mexican deluxe body SB, light and grainy. CS '69 pickups, switches and pots. Plays great, to my ears it has a warm, woody tone. Not my favorite to play though, that would be a CS '66 LE. It came with a heavily checked Ice Blue Metallic body. I swapped that for a newish AS Charcoal Frost with vintage style two point bridge. A little too twangy compared to the first one I mentioned but to my eye it looks so good! It has the modern FB radius and frets too. My current MIM and a previous AVRI '57. A 1995 MIM "Black Label" (non-Squire Series). I had a Player Grade 59 strat. Many others but these 2 stand out. 1998 Big Apple, hardtail, rosewood, Teal Green Metallic. Had Lace Hot Golds in it for a long time but now the SD humbuckers are back in it and it sings. I have newer ones but the neck on that 98 is my fave. Since my last post in this thread, 11/26, I swapped the necks of the two Strats I mentioned. Maple fretboard CS '66 neck now on the Mexico DeLuxe body and vice versa. Eh...I'm going to switch them back when the strings get crusty enough. no significant difference other than the string height. With no adjustment the strings are too low on one and too high on the other. Mine is my CS 59 Journeyman Relic in Daphne Blue. Nothing I played sounds that stratty and it is so comfortable to play. I've only ever had three. Me and Strats just never got along. I would try them out and just not like the feel or the sound or both. My first one was an Ebay find. $19 plus $40 for shipping, no name, horrible feel. Sold it immediately. Next was an Aztec Gold Affinity. Now that was a different story, loved the way it felt and I was okay with the sound, so I bought it. Put in a Dragonfire loaded pickup with Vintage pups. I still have it. Not bad at all. But my favorite is my MIM Deluxe Player's Strat. I love the neck, love the Strat-like tones without the 60 cycle hum, and I just think the guitar is gorgeous. tobacco sunburst finish, gold hardware, brown shell pickguard. It's my style completely. Right down to the slightly muted tones of the Vintage noiseless pickups. Best strat I've owned? The one that I sold... *sigh* The grass isn't always greener. It's OK, Viera. I'm more of a Tele guy in the big picture and the Strat was only a garden-variety MIM. Still, it was a nice guitar, one made all the better with a couple of mods, like Bill Lawrence pickups. ‘05 Deluxe Vintage Player ‘62. It’s a cool hybrid of an AVRI and a Deluxe. 1959 Hard Tail.Player grade but killer guitar. Next closest is a 65 AVRI. I had posted earlier that my Agile Strat copy was my best and I use it sometimes for gigging. But I finished some of the upgrades on my SX Strat copy and I have to admit that thing sounds pretty dang good. I have been using it at rehearsal. My set up there is into a Zoom G2 into my Traynor Blue. Maybe it's just the amp but I can get just about any sound I want. I use every pickup position and it sounds great. I have had several different sets of pups in it and put the originals back in. It has an amazing amount of sustain for a cheap guitar. The neck is a little chunky but not too much. It's green with a maple neck and fretboard. I wish I would have bought one of those Agile Strats when they offered them. I did buy the Tele version and it is an exceptional player.